Speaking to somebody through a dating app such as Tinder can often be toe-curlingly awkward, especially if they just don’t get your wicked sense of humour. A poorly used gif, a clumsily dropped innuendo, and the game is all over. And all this is before you even get to those who lack any spark of humour whatsoever. 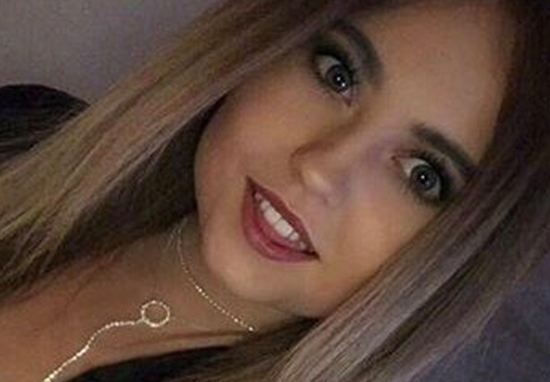 When Chloe Lucas from Chesterfield found herself in such a situation, she reacted perfectly and let her match know his response was just not cool. Now, we all like to get a bit silly with our Tinder chat from time to time – especially when your mates are egging you on – and this Tinderella is no different. So is it Chloe or Chlo? Obviously birth name is Chloe but I prefer being called Chlo. So far, so average small-talk Tinder world. And it was at this point when Chloe decided to get a little bit cheeky. Well, what do your friends call you? The match appeared puzzled as he asked, ‘Wtf why.’ Was Chloe an aristocrat? Was she the ghost of a historical figure/bossy nursery rhyme character? People were amused by Chloe’s all-too-relatable experience and the singleton quickly went viral. 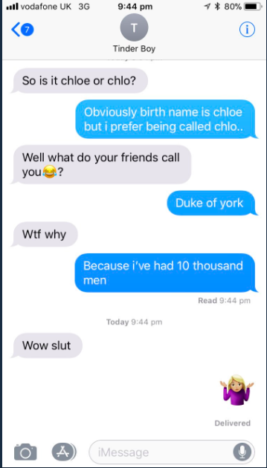 Slur aside, Team Chlo – or should it be Team Duke of York? – were gobsmacked by the funny bone removal surgery Tinder Boy had apparently undergone. Got to have banter no matter what! I would’ve been dying laughing if a girl sent that to me? Sounds like Chloe is well shot of that particular gentleman and – like all dating disasters – it has given her friends a good laugh. Have you ever had an awkward experience on Tinder? Let us know!